Starting off with an infectious pop-rocker, "Astronaut", a song as poppy as it is rocking, and following it up with a weepy, light number by the name of "Waiting On A Friend". The contrast of Luna's two sides come together and create a mesmerizing sound on their latest, the Close Cover Before Striking EP. The band sounds in fine form. Their brand of only remotely spacey, warm, and melodic pop-rock breathes a fresh set of air. The years of working hard and sometimes running into dead ends taking little or no toll on the band as they set their sights on the future and work towards it, continuing to write beautiful pop songs that are as creative and stable as they come. 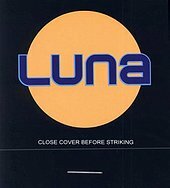 The Sunday feel of "Teenage Lightening", with its nostalgic slide guitar that recalls last week's love and sorrow, and the airy, sleepless late night of "The Alibi" are two more fine examples of Luna's commitment to quality and their ability to achieve it every time they put something to tape. I'll give this a B+.